Amun-Re retained a large crowd in its sophomore year at WBC. Despite its very early convention start on Tuesday at 8 PM, the first heat attracted roughly 50 players. The second heat on Thursday at 9 AM saw several of these players return to match pyramid building skills against newcomers. In all, 20 different games were played in the qualifying rounds involving 73 players. 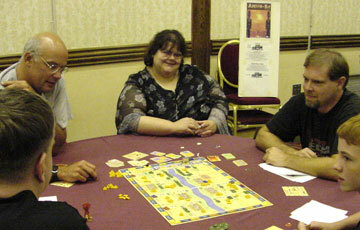 The economic, planning and interactive elements of the newest Knizia game drew a diverse crowd including many 'wargamers', such as Bill Crenshaw, Nick Anner, Michael Zehnal and John Emery. The 'Euro' game crowd was well-represented by WBC and EQ defending champ Arthur Field, who was joined by Davyd Field, Tom McCorry, Rob Flowers, Tom Dunning, Brian Jones and many others. All four of the prior finalists were in attendance and each won his respective heat. Richard Meyer, Ilan Woll, Luke Koleszar and Arthur Field were joined in the semi-finals by Eugene Lin, Evan Tannheimer, Davyd Field, Paul Haynes, Nick Anner, Steven Quade, Phil Yanov, Andy Gerb, Doug Gallulo, Jonathan Tivel, Steve Cameron and Doug Smith. The 16 semi-finalists competed in four-player games. In an attempt to make all boards the same, the GM eliminated the same three provinces from all four games. This had been published prior to WBC and the provinces had been selected in an effort to even out the effects of elimination. Upon reflection, random elimination seems a better course; some power cards become too weak otherwise. The semi-finals produced an unusual twist. Arthur Field was matched against his perennial nemesis Nick Anner. Field was comfortably ahead going into the end of the game. In a bizarre last round play, Paul Haynes fell upon his ankh to play Pharaoh-maker. Settling for last place, Paul attacked Arthur and helped Nick seize the win by a single point. Cries of anguish could be heard all along the Nile. Similarly, all of last year's finalists were torn to shreds in Osiris-like fashion by the forces of Set. Nick advanced to the finals to compete against newcomers Andrew Gerb, Evan Tannheimer and Jonathan Tivel. The same three provinces were eliminated and Evan emerged as the winner and clear favorite of the gods. Isis was last seen trying to stitch Arthur, Richard, Ilan and Luke back together so they could play in next year's tournament.